The purpose of this project was to measure the Vitamin C content of various fruit drinks and juices. 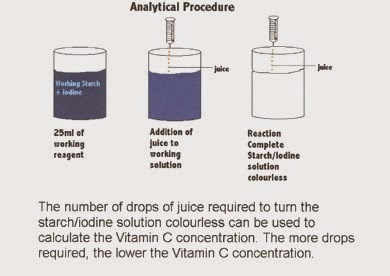 My hypothesis was that if Vitamin C in juice is titrated with a starch/iodine reagent, then the juice with the largest amount of Vitamin C will complete the reaction sooner than juices with less Vitamin C. I believed that the pure Florida juices would contain the highest Vitamin C levels and would meet the recommended daily allowance (RDA) of 60 mg. The juices were titrated into a reagent containing starch and iodine. The amount of juice needed to complete the reaction was a measure of the Vitamin C content. The volume of juice titrated was compared to the volume of Vitamin C standard titrated to calculate the Vitamin C content. I assumed that it was only the Vitamin C in juice that reacted with the starch/iodine complex. A more sophisticated method to accurately determine the Vitamin C level would be necessary to verify the results. My hypothesis was correct. The juices containing the most Vitamin C titrated the starch/iodine reagent with the least volume of juice required. The pure Florida juices contained the least amount of Vitamin C compared to the other juices tested. I would recommend the purchase of drinks containing added Vitamin C such as Welchade Grape. 1. 25 ml of working starch/iodine reagent was poured into a plastic cup. 2. 4 ml of Vitamin C standard was drawn into a 10 ml syringe. 3. The standard was titrated into the starch iodine reagent drop by drop. The number of drops required to change the reagent colour from blue to clear were counted and recorded. The reagent was gently mixed after the addition of every few drops of standard. 4. Steps 1 to 3 were repeated to ensure precision. 1. 25 ml of starch/iodine reagent was poured into a plastic cup. 2. 4 ml of juice was drawn into a syringe. 3. The juice was titrated into the starch/iodine reagent. The number of drops required to change the reagent colour from blue to clear were counted and recorded. The reagent was gently mixed after the addition of every few drops of juice. 4. Steps 1 to 3 were repeated to ensure precision. The difference in the number of drops counted for the two tests had to be 2 or less or the testing was repeated a third time. I expected that the pure Florida juices, President's Choice Orange and Master Choice Grapefruit would contain the highest Vitamin C content. This did not prove to be true. They had the lowest concentration of Vitamin C of the juices tested and I had to titrate larger volumes of these juices to complete the reaction. The recommended daily allowance of Vitamin C is 60 mg. All products with the exception of Master Choice Grapefruit met this requirement. Welchade Grape Juice is an excellent source of Vitamin C, especially for children, since they would only need to drink 60 ml to meet the RDA. All products with the exception of President's Choice Orange and Master Choice Grapefruit had Vitamin C added. This seems necessary because either there is not enough Vitamin C in oranges or grapefruits or it is affected by the processing of the juice. It is known that Vitamin C is lost when it is exposed to heat or light. I would recommend the purchase of juices with added Vitamin C. Vitamin C would be more stable in juice containers that are protected from light such as juice packs or cans.